We meet in Yiewsley Baptist Church Hall in West Drayton every Thursday evening* from 19:30 to 22:00. 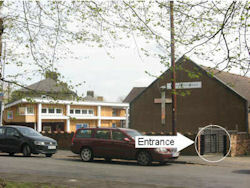 The hall is located at the intersection of Fairfield Road and Colham Avenue. Busses 222, U1, U3 and U5 stop on the Yiewsley High Street (near Fairfield Road); bus 350 stops in Horton Road (near Albert Road) and West Drayton mainline station is a few minutes walk away. In the evening and weekends there is plenty of on-street parking (no permit required) in the surrounding area and, for those with Sat Nav, the postcode UB7 8HF may be used. For entry to the hall, please use the small black metal gate just to the right (as you look at the building) of the church and follow the path to the door. How to find us map. * Except if there is an election or church event e.g. Maundy Thursday, Christmas Day, etc. To find out more, contact Club Secretary E-mail. If you're interested in becoming a member, like most clubs, we have some rules. These are available in the attached pdf document.